Goat evolution? 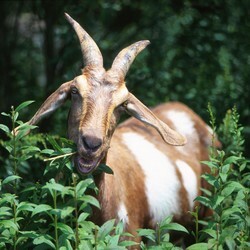 Some populations of goats thrive on particular leaves that are toxic to other goats. This used to be attributed to evolution, with the leaf-eating goats being said to have evolved their ability to eat the leaves. This was disproved by the brilliant creationist agricultural scientist Dr Raymond Jones, who surmised that the ability was due not to evolution but to helpful gut bacteria. Sure enough, ordinary goats dosed with bacteria-laden stomach fluid from the ‘evolved’ goats were suddenly able to consume the leaves without becoming sick—see The Luecaena story. There is wide variation in hornage and pelage (wool/hair) amongst the tsōn kind. You can get varieties with no horns (i.e. polled), two horns, four horns (e.g. Manx sheep—pictured) and even six horns (e.g. some Jacob sheep). You can get species with beards, species with manes (e.g. the Barbary sheep), and even varieties with bald patches (see No flies on ‘freak’ sheep). This week’s feedback comes from Raymond W of London, United Kingdom, who has some questions relating to an article he read in the latest issue of Creation magazine. Andrew Lamb replies. 1. Were sheep and goats one kind prior to the Flood, and thus speciation took place post-Flood? Or were there sheep and goats pre-Flood? 2. Did domestication take place pre-Flood or post-Flood? 3. It is universally assumed that the ancestor of the domestic goat is the Bezoar (Capra aegagrus), but is it possible that the origin of the domestic form came at a time before distinct speciation had taken place? The field of study concerned with identifying the original kinds is known as baraminology, from the Hebrew term for biological kind, baramin. The biblical kind often equates to the family level in the modern biological classification scheme, and sometimes to genus or order. Some excellent baraminology papers have appeared in recent issues of Journal of Creation, including one on the sheep-goat kind1 by Dr Jean Lightner, who was also the author of our Creation magazine article on sheep and goats. Importantly, sheep and goats differ in the number of chromosomes. Goats have 60 chromosomes while domestic sheep have 54 chromosomes. Despite this, hybrid offspring can be produced, having 57 chromosomes—see sheep-goat hybrid for an example. 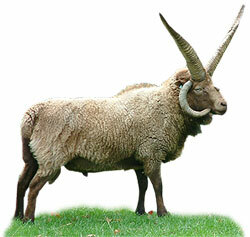 However, fertile sheep-goat hybrids are extremely rare. Fertile hybrids are not unusual in all animal kinds. Consider the Equus (horse) kind. Domestic horses have 64 chromosomes while Przewalski’s horses have 66, but they can produce fertile offspring—see Resurrecting a prehistoric horse. Donkeys have 62 chromosomes, but occasionally fertile mules (donkey–horse crosses) are produced—see Mule gives birth. Zebras have only 44 chromosomes, but they readily hybridize with horses (66 chromosomes)—see Shetland-Zebra hybrid. Secondly, as the article goes on to explain, one of the characteristics that distinguishes sheep from goats is that sheep have no guard hairs, only underfur (wool). If the individual specimens on the Ark had been sheep that had lost the genetic information for guard hairs, then it would be difficult for strains of goats, which do have guard hairs, to arise subsequently, as this would require the regaining of lost information. Pre-Flood people certainly kept livestock, though this may not have involved a need to tame them. Besides Abel, mentioned previously, who kept a flock to provide animals suitable for sacrifice, there was also Jabal and his clan (Genesis 4:20) who kept livestock. After the Flood, God gave Noah and his family (and by extension all mankind) permission to eat animals, while simultaneously advising them that the animals would fear them (Genesis 9:2-3). This could suggest that in the pre-Flood world animals may not have feared people, in which case domestication, in the sense of taming wild animals, may not have been an issue in the way that it is in the post-Flood world. Collectively they would convey to the post-Flood world a comprehensive range of the genetic variety for their kind. Noah and his family would not have eaten meat in pre-Flood times, since God had designated plants to be mankind’s food (Genesis 1:29) and Noah was a blameless man (Genesis 6:9) who did what God commanded (Genesis 7:5). Apparently it was no longer possible after the Flood for people to easily get all the nourishment they needed from plants alone, hence God’s explicit permission to eat flesh. So, deliberate breeding of varieties of tsōn lacking guard hairs could potentially have already given rise to sheep and goat varieties before the Flood. Sheep and goats are clean animals (as later codified under the Levitical law), so there would have been seven of the tsōn kind taken aboard the Ark. Those seven individuals could have been ‘pluripotent’ non-specialized tsōn specimens, each still containing a comprehensive range of the genetic information for their kind. Or alternatively, perhaps there could have been both sheep and goats, and even other varieties, among those seven tsōn on the Ark. Individually, they would each provide just a distinct subset of tsōn genes, but collectively they would convey to the post-Flood world a comprehensive range of the genetic variety for their kind. Whichever species of goat or sheep today is the most genetically robust, having retained the greatest range of the created genetic variety originally present within its kind, would be the species that we would consider closest to the ancestral kind. For the tsōn kind, this may well be the wild goat (Capra aegagrus). Not all populations of wild goat are referred to as bezoars. 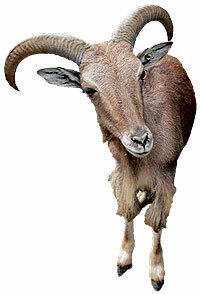 The bezoar is defined as a ‘wild goat with flat scimitar-shaped horns’ 5 and it belongs to the main goat genus, Capra. There are both ancient6 and modern7 records of bezoar-domestic goat hybrids. We do not know the exact limits/range of the tsōn kind, but it probably encompasses animals from several other genera besides Ovis (the main sheep genus) and Capra, potentially including animals such as the serow, goral, tahr, chamois, bharal, and takin. Most of these animals look pretty much like goats or sheep, though some look a bit antelopish. See Dr Lightner’s Journal of Creation paper for a comprehensive discussion of the issue of the range of the sheep-goat kind, and a table of hybrids recorded in the academic literature. More and more animal genomes are being sequenced, and new techniques in gene sequencing are leading to rapid progress. With respect to the human genome, enough sequencing has been done that it is already becoming possible to trace a person’s genealogy through gene-mapping (see Human genetic diseases box below). Similarly, as more sequencing is done on the various sheep and goat species, it may become possible to re-trace tsōn speciation events. With sufficient genetic testing, it may one day be possible to determine the exact sequence of speciation among the various descendant populations. It will also become more apparent which similar-looking species are indeed related, and which are separated by unbridgeable genomic differences, descendants of different original kinds. Study of the genomes of tsōn species will also indicate which are likely the most genetically depleted/degenerate, and which are the most genetically robust, and hence closest to the original created tsōn kind. However, in answer to your specific question, domestic goats (Capra aegagrus hircus) are classified not as a separate species, but merely as a subspecies of the wild goat (Capra aegagrus), so it seems distinct speciation has not taken place between these two daughter populations of the tsōn kind. Every person on earth carries in their genome their own personal set of hundreds of genetic defects, and these defects accumulate from one generation to the next as new defects are incurred. This phenomenon is known as ‘mutational load’. DNA molecules are very large and fairly unstable. Radiation and contact with water and other chemicals are continually causing chemical ‘letters’ on the DNA strands to become unreadable. Besides straightforward damage like this, DNA can also incur copying errors such as deletions and insertions during mitosis (cell division). Countering this, living cells have an incredible array of specialised machinery devoted to detecting and rectifying any such errors, and continually in operation throughout the cell’s lifetime. There are hundreds of enzymes that go up and down the DNA, comparing the two strands and replacing any damaged base pairs. However, despite all this, errors do occasionally escape detection and repair and become fixed in the DNA. And if a mutation becomes fixed in a sperm or ovum cell, then there is the possibility of that mutation being passed on to the next generation. Every single one of us has a few more mutations than our parents had, and so each person’s own unique set of defects thus constitutes a complete history of their ancestry back to Noah’s family. Most genetic diseases can be caused by more than one specific mutation. For example, to date there are 130 different recorded mutations of the CFTR gene on human chromosome 7 that result in the disease cystic fibrosis. Six other mutations of this gene have been identified that cause other diseases, such as ‘congenital bilateral aplasia of the vas deferens’.11 All this is very consistent with the biblical account of post-Fall degeneration from an original ‘very good’ (Genesis 1:31) state. DNA sequencing potentially provides the means to compile complete genetic lineages for the entire human race, and several efforts to do just that are already underway, for example The DNA Ancestry Project and The Genographic Project. For some biblical applications of this type of research, see the articles on ‘Y-chromosome Adam’ and ‘Mitochondrial Eve’ in Q&A: Genetics. Jean Lightner, Identification of species within the sheep-goat kind (Tsoan monobaramin), Journal of Creation 20:61–65, 2006. Return to Text. Wikipedia, Capra (genus): Similarity to sheep, <http://en.wikipedia.org/wiki/Capra_(genus)#Similarity_to_sheep>, 11 July 2007. Return to Text. Jean Lightner, Separating the sheep from the goats, Creation 29:43–45; 43. Return to Text. Henry Morris, The Genesis Record, page 146. Return to Text. The New Oxford Dictionary of English, Clarendon Press, 1998, page 168. Return to Text. 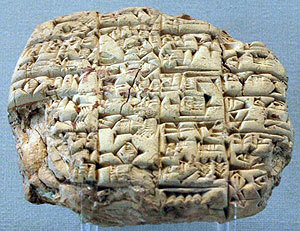 art/clark/CUNEIFORM.HTML, 27 July 2007. ‘EC’ stands for Edward Clark, the finder of the tablet. Return to Text. http://www.huntingenthusiast.net/viewtopic.php?p=1155#280, 27 July 2007. Return to Text. Queen Victoria was a carrier of the disease. Being a carrier means that her DNA had the mutation, but it was not expressed. The mutation responsible probably originally occurred in the sperm from her aging father which fertilised the ovum from her mother from which she grew. Family, Life and Health Encyclopedia, volume 12, pages 1662, 1665, Marshall Cavendish 1970. Return to Text. The secular book And Their Ghosts May Be Heard by Rupert Gerritsen details such claims. Return to Text. <http://www.ncbi.nlm.nih.gov/entrez/dispomim.cgi?id=602421>, 27 July 2007. Return to Text.